I wanted to create something that would work for routine plug and chug problems, some more multi-step problems, and some “explain this” problems. I also know I’m going to be doing some major “holistic” grading — in the sense that I am not going to take off this many points for this mistake, that many points for that mistake. I’m going to look at how the student performed on one or two questions testing the same skill, on the same short assessment, and give them a holistic grade for that skill. I think this rubric allows for that pretty well. Plus, I need something I can point to, since my teaching mantra is: clear, consistent, and fair. Without something I can point to, I would be failing on all three counts. Thanks for posting this! I really like the kid-friendly language you used for your scale and plan on using something very similar this year for my classes. I know not including the ‘show all work part’ was something I neglected last year and need to work on this year. Thanks for posting your rubric! I was working on mine recently. I’m going to try SBG for my physics classes, but not my 9th grade physical science classes. 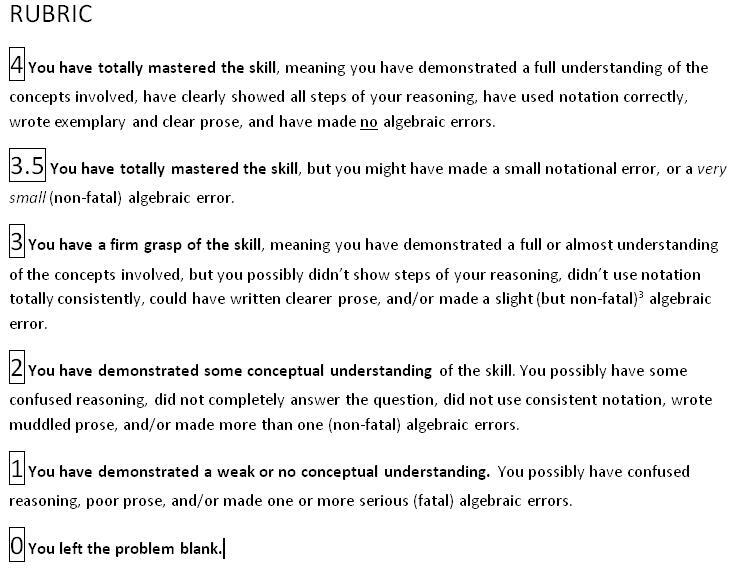 I noticed that you put algebraic errors in the rubric. I wasn’t sure what to do, then I decided I would make performing algebra, showing work, etc. separate standards in and of themselves, separate from the content or skill standard. I don’t know if I’m breaking things down into too much minutiae, but I didn’t feel quite right saying that they didn’t quite get, say, a kinematics standard because they messed up the algebra, substitution, etc. So, I made what I call “ongoing” or “foundation” standards that I expect them to adhere to in all work–such as use of sig figs and units (btw-I don’t agonize over SF–I use 3 most of the time, I expect about the same, but not the entire calculator display, and never 1 SF); showing work in a clear, understandable manner; algebra competency, and so on. So, I figure that when I have a test, I only change the ongoing standards if there’s a problem, and I can separate their content understanding from those minor errors. I don’t mean any criticism–I’m just bouncing ideas because I’m struggling with figuring this all out! And something tells me I’ll be making modifications a lot this year! I look forward to hearing your adventures with SBG! Hi Sam! I like your rubric and all the thought you are putting in. Working with ELLs, I’m always trying to say things with as few words as possible…I just read a rubric in the NCTM “Mathematics Assessment Handbook:” WOW, OK, HMMM, and Yukky. I might try something like that….especially the Yukky might get the point across. Thanks for posting your rubric – its nice to see how others have decided to tackle this. After reading a bunch of the blogs related to SBG, I think I’m finally ready to make the jump. Now my question for you is how are you planning on coming up with the percentages that are required on report cards? Are you taking the mastery levels and converting them into a grade of sorts? I’m working with a small group of students in an adapted class and am considering having them input into what number goes onto the report card based on the mastery level feedback. Thanks again for blogging about your SBG journey! I’ll be writing more about this, and posting what little I’ve come up with, but the short answer is: a student’s grade for a skill is their most recent score. I’m just going to divide all the points they earned over all the possible points. Other people have written about other ways to come up with grades. But I think for my first time trying this, this seems most logical, and most consistent. I hope you don’t mind if I meld it with mine. Thanks so much for all your blogging and putting this up. I always feel like my head is on a little straighter after reading your blogs. Sam, this rubric is really great for math classes. I am struggling with how to differentiate between 3.0 and 4.0 in my computer science classes. Do you know anywhere I could find a similar rubric for CS? Feel free to contact me directly at rwistar@hotchkiss.org. Thanks! Oh thanks! I actually have no idea……….. I don’t follow CS teachers on blogs, really. Sorry! I follow a few CS teacher blogs, but there are very few CS teachers in K-12, so very little penetration of SBG into CS teaching. I’ve seen more discussion of what the entry-level curriculum should cover, peer instruction, and gender and racial balance. The file includes my basic generic rubric as well as an analytic rubric that is far more detailed and nit-picky that I use to introduce SBG. I also include some thoughts about rubrics and SBG in general. I realize this is an old thread, but a recurring issue nonetheless. Thanks for sharing this rubric. I have been using a similar 4 point scale for the past year, but I never wrote it out in a rubric. This was really helpful in hashing out exactly how I was grading student work, and it helped me share my grading system with other teachers at my school. Thanks for letting me know! I love that it’s useful. I have since changed things to a five point scale, but it’s fairly similar!